Lorna @Sew Fresh Quilts is hosting the Elephant Parade Quilt-A-Long, and I decided that the design was too cute to miss out on! The QAL started on February 1st, so this is the second week of instructions. The first week, Lorna shared the instructions for the large elephant. This week follows up with the small elephant. I also chose to purchase the Elephant Parade Pattern from Lorna. Including cutting time, it took me 2 hours to make the (5) large elephant blocks and another 4 hours to make the (14) small elephant blocks. I really think they are fun and cute, and I look forward to following along with the rest of the Elephant Parade QAL. One of the reasons I am so excited about this quilt pattern is that it reminds me of the fantastic vacation to Tanzania, Africa, my husband and I were lucky enough to take in 2012. We saved money for years to be able to visit Tarangire National Park and the Serengeti, and it truly was the trip of a lifetime. Below are a few of the best photographs I took of elephants during the visit. A few things I want to point out in the photos… in the first photograph, the female on the right approached the male on the left to greet him, she placed the grass she had been carrying / eating on her shoulders. After acknowledging one another, she grabbed the grass off her back and ate her tasty meal. Elephant twins are extremely rare, and it was a treat and delight to watch the two shown in the last photo romp around under the close eye of their mother and herd. There were a few juvenile elephants in the pack that started playing a bit too rough and close to the twins, and the mother let them know to leave her twins out of their shenanigans! If you are interested, you can see some of my husband’s best Wildlife photography (including many from our trip to Africa) on his website, Michael Fuchs Photography. Your elephant blocks look great! And your pictures are beautiful!! Elephants are such wonderful creatures! The trip to Africa must have been so exciting! The photographs are amazing. Your elephants are also looking very nice hanging up on your design wall, Yvonne. Chain piecing was a time saving way to construct your beautiful herd. Glad you were able to keep your herd heading in the right directions! 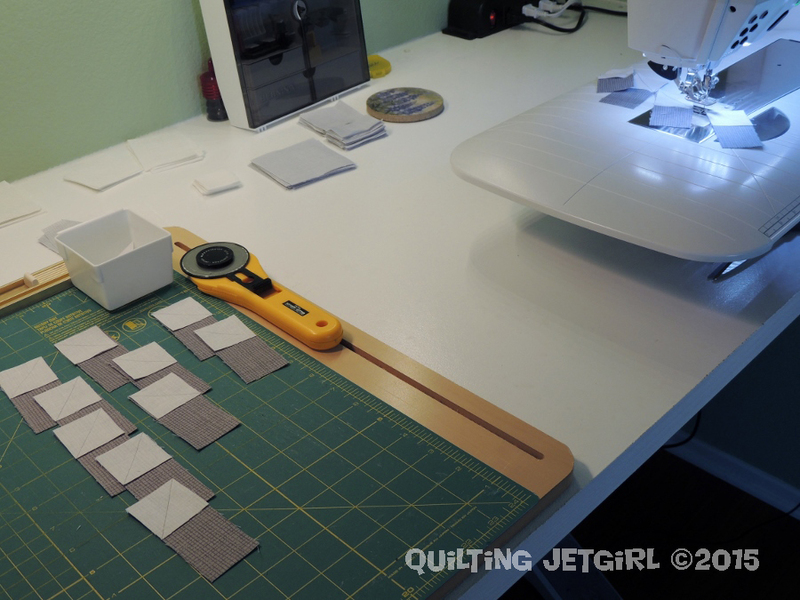 I recently discovered how helpful chain piecing can be and now find myself looking for ways to use it more in the tops I piece. The elephant quilt is looking good. After hearing about your trip I can see why you are so excited to join the QAL! Fabulous photos – not sure what it is about elephants but there is an instinctual reaction to them. I’m loving this QAL and hope to get making some this weekend. They look fantastic up on the design wall, the baby ones in particular all in a row! Oh they are looking so good. Elephants are my favourite – probably because I grew up in India! Your elephants are so stinking cute! And what an amazing trip you and your husband were able to take. Those pictures are great! These elephants are so cute (both pieced and real)! And what a great experience, to get to see these animals in a natural setting! I love your fabric choice! Sew pretty! You definitely sew at thes peed of sound! I’m finishing mine up tonight (I hope)! Too cute for words! I’m curious how you’re doing the other friends in the batch! Your elephants are too cute! And what an amazing trip!!! I loved seeing the pictures. I also really enjoy chain sewing. It definitely speeds things up. The blocks are looking great! I’m hoping I can catch up when we get to Japan 🙂 Everyones are just so cute!! What a great way to remember an amazing holiday. great blocks, but those photos are totally awesome!!! I’m really enjoying seeing all the elephant posts. Such a great pattern!! These are so cute! And what a fun way to relive your Tanzania memories! Love your choice of fabrics so far. Six hours to make nineteen elephants is pretty good when you consider it takes one elephant 21 months to make a new baby elephant (gestation period)! Your elephants look like they’re dancing in a long line to me! Chain piecing is definitely something I should think about more, glad to find out more about the secrets of your speed.